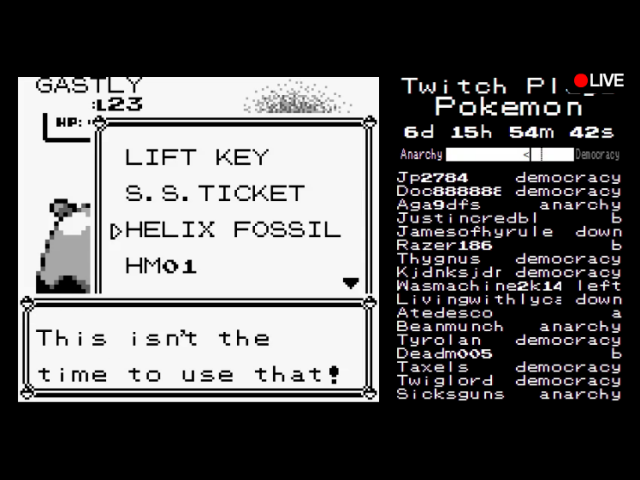 Twitch Plays Pokemon: Can Thousands Work Together To Be a Master? The past few days a social experiment has taken over Twitch. Twitch, for those who may not know, is an interactive streaming website primarily focused on gaming. 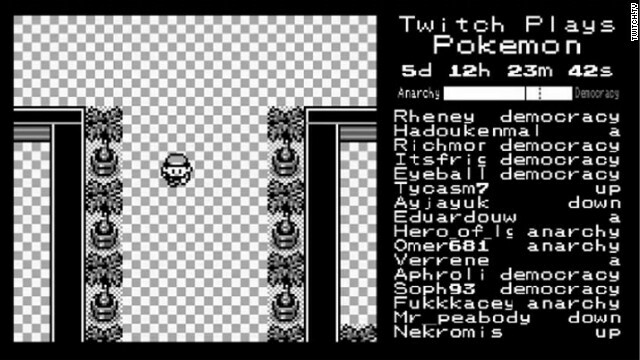 This past week, a user by the name of TwitchPlaysPokemon uploaded the 1996 classic Pokemon Red to the servers of Twitch, enabling the game to be controlled via chat commands. The results are hilarious, interesting, and insane. When the game went up on Twitch earlier in the week the play mechanics were amusing and novel. A player, in a chatroom of about 100, could enter a command and see the onscreen player move accordingly. Then thousands and thousands of people jump aboard. At its peak, Twitch is reporting that over 80,000 players were participating and watching at once. The result is a spastic main character who seems to be struggle to do anything but walk around in circles. The goal, now, has become to journey through the game as a group. However, to better function tweaks have been made to the game. A few days ago, a change was made to the game to allow for a more civil play experience. Players now have the option of voting for either Anarchy or Democracy. When the majority of players vote for Anarchy, the game is carried out in the same fashion as it was when it first began; chat commands from all players dictate how the main character moves. When the majority of players vote for democracy, chat commands are disabled and players instead vote on what movement to make and the game moves with the majority move. Of course, it even gets more absurd when the game gets thrust into battle. The results have been absurd and have spawned memes and jokes across the internet. I don’t have time to explain the Helix thing.. The sheer fact that this democratic system for working together has arisen in this chaotic world is incredibly interesting, both from a gamer’s perspective and a sociologist perspective. TwitchPlaysPokemon has become a fascinating case scenario for how the internet can create unique social experiences in places that once were not social. It shows the creative ability of group interaction to change and add new life into something from the past, and re-imagine what it is to play video games together. Even if you’re not into for its social implications, it’s still a hell of a funny thing to watch. This entry was posted in gaming, Uncategorized, video games and tagged Gaming, Nintendo, Pokémon, Social Media, sociology, Twitch, Twitchplayspokemon, Video Games. Bookmark the permalink. 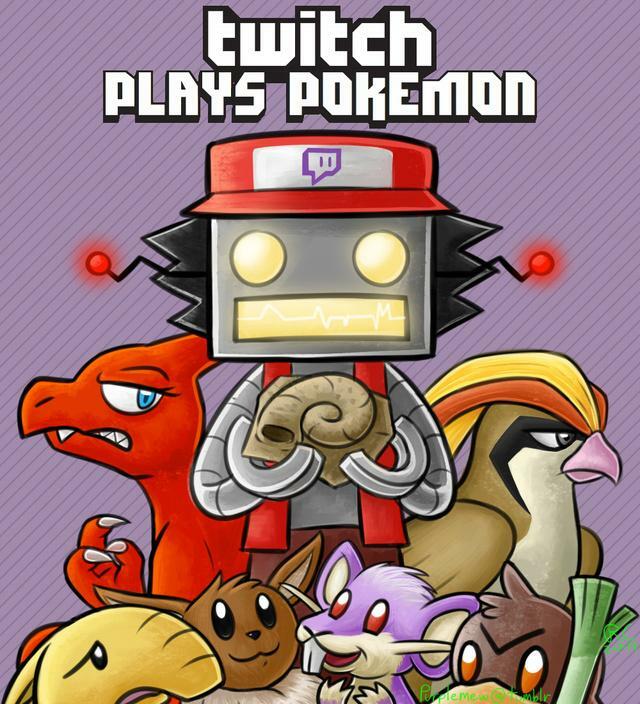 1 Response to Twitch Plays Pokemon: Can Thousands Work Together To Be a Master?